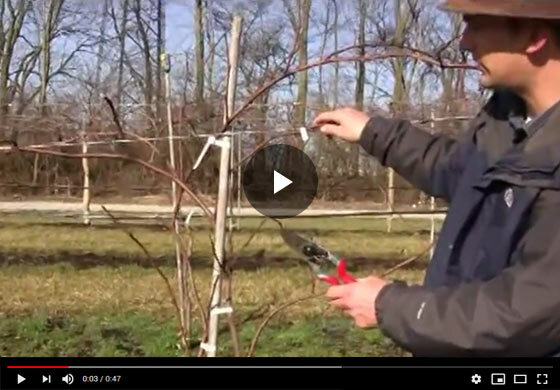 Gurney's horticulture expert Felix demonstrates the process of pruning a grape vine with two primary shoots. Find out how to plan your cuts in order to create a well balanced and productive curtain system for your grapes. Hi everyone, this is Felix at Gurney's and we're talking about grapes here. This is a grape that was planted last year and it's initiated some shoot growth from the base, and I want to talk a little bit about a how to handle that. We have basically two canes, one behind this bamboo which we're training onto and another one right here that have initiated from our planting last year. So we got a bare root plant and it had a shoot on it. A little handle which we had some break coming of so this is maybe the old shoot there, and we have two primary shoots and what I want to do is tell you a little bit about how to frame this vertically. So we have a single cordon and then the curtain system which you've seen in some of our other videos. The consideration here is that this one behind the bamboo is nice and straight, this curvature here is really not what I'm after so that's going to be the one that comes out. If we follow this up, here there's basically a sprawl of vines here on this trellis, you have a 2-mile drilling system. There's a sprawl, even though we're going to have some fruit load taken out by this, we have plenty of fruiting buds here on this cane. All these little buds here are going to produce fruit. So this vertical growing cane is going to produce plenty for us this year. Really, I want to take that out this season, so I'm going to cut this at the base. I just pull this whole line off, even though this may be a little imposing and intimidating for folks, it's great to really vigorous growers and we're going to have plenty of production off of these, and really this is the second year, we're developing a framework here, and so some of these shoots here, you're going to get some fruiting, but since we talked about before...and here, this is where we're going to initiate our curtain. It's a nice vine, it's fairly work straight. We're going to tie this one up here so it's nice up against that bamboo and I'm just going to top this one right there and what's going to happen, is we're going to get bud flush, that's going to eventually train against this wire...so basically, we've taken what was a significant amount of growth last year and that good system is in place, and then we've left what is our primary, and then it's his break, which we'll show you in another video how to train those along our curtain to establish that framework that you can see in some of are older plantings, how that manifests, and that's where your crop load is going to be, going to get nice sun exposure there, which makes a really nice growing system. That's a single curtain system, this is kind of how you treat it in the dormant season to establish a framework after your first year of establishment growth.